Mural Acrylic Paint 66" x 190"
Please enjoy my art art on these pages, or come see my art on display until March 2016 in the rooms of the Los Altos Hills Town Hall, 26379 Fremont Road, Los Altos Hills, California. It's open to the public. 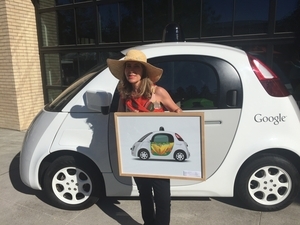 Inmaculada is a winner of the Google "Paint the town" contest. 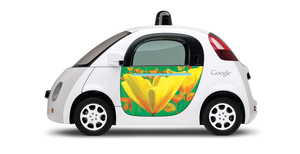 Her painting of a field of poppies will be on the side of Google's self driving cars starting in the fall of 2015. Photos and paintings are for sale, often done as custom pieces due to their large size. Just ask. Please email me at i@artdelcastillo.com for inquiries if you want a print or painting, or just want to say that you enjoyed looking.